This is the micrometer adjustable torque wrench for industry! Accurate, incredibly durable, of high-access design, it has every feature that brings genuine value to maintenance and small assembly operations. Torque is adjusted by rotating grip. Simple adjustment is made even easier with the highly legible and very durable markings on the scale and increment band! Simple thumbscrew mechanism locks to avoid changing torque setting accidentally. This simple mechanism prevents inadvertently changing the torque setting while in use, and takes only a few seconds to lock or unlock. The aluminum increment band is color-coded: black for inch-pounds, gold for foot-pounds, blue for Newton meter, red for kilogram meter. Color-coding permits instant identification of the correct units of measure for efficient use when multiple wrenches are at the work location! Ball bearing rockover assembly assures smooth operation, enhances repeatability, and increases the cycle life of the wrench. The flattened case of "clicker" type torque wrenches provides support to ball bearings that gently guide and support the rockover mechanism. They also make the tool almost impervious to side load error and greatly enhance repeatability, as well as assuring an exceptional tool life! Neoprene rubber grip for cushioning and oil/chemical resistance. The grip shape is designed to guide the hand to the proper position on the tool, provide solid ergonomics, and to stand up to almost any assembly environment! All tools of 250 foot-pound (or equivalent) capacity and below come with a custom molded plastic case. This protects your investment in quality during storage or transport! 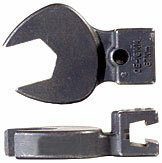 Ratchet design is exceptionally strong and durable. The durability of the "through pin" design of ratchet maximizes uptime both through durability and ease of maintenance when that rare occasion arises. This is one more small component in lowering the cost of ownership and increasing ROI! Accuracy of +/- 4% Indicated Value from 20% to 100% of capacity meets or exceeds ASME B107.14M and ISO 6789. Designed to meet or exceed the highest applicable standards. **Optional extension tube can be ordered. Use of the extension tube requires recalibration of wrench. The CCM Series offers the ultimate in efficient versatility, combining rapid micrometer adjustment of torque setting with the ability to accept over 140 interchangeable heads! This flexible efficiency is ideal for maintenance, field maintenance kits, and flexible assembly operations. Accuracy of +/- 4% Indicated Value from 20% to 100% of rated capacity meets or exceeds ASME B107.14M and ISO 6789 requirements to deliver consistent quality! CCM Series wrenches each come with a FREE tabulated NIST-traceable Certificate of Calibration that meets your ISO and QS requirements! Excellent audible and tactile impulse when torque is achieved, making it easy for the operator to perform the torque application process properly. Bi-directional versatility is obtained by simply removing the head, turning the wrench over, and reinstalling it. The slender design permits use in limited-access applications where larger tools simply will not work. The extremely versatile system permits use of fewer wrenches by connecting to any of over 140 Interchangeable Heads, plus extensions, adapters, and your own custom heads! 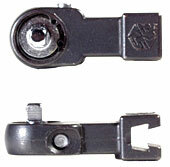 Unique dovetail design transmits the load at a right angle from the wrench to the head, providing exceptional strength and rigidity of connection. The aluminum increment band is color-coded for rapid identification: black for inch-pounds, gold for foot-pounds, and blue for Newton meters. The ball bearing rockover assembly assures smooth operation and an exceptional tool life! 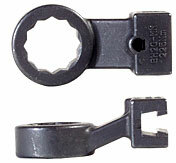 Unique dovetail design used to join head and wrench provides an exceptionally strong connection and allows complete interchangeability.